Pictured in rustic quarter sawn white oak with Briar stain. Pictured in rustic quarter sawn white oak with Tavern stain. Pictured in rustic quarter sawn white oak with Sealy stain. The smaller Rio Mission Bookcase has exposed mortises in the front corners. The sides are recessed panels each with long, narrow vertical slats. The practical Mission top is squared off. 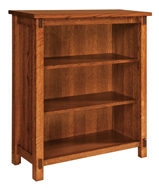 The full size Rio Mission Bookcase is solid wood to store all your books for decades. While elegant, the bookcase has character in its six exposed mortises in the front. Two recessed panels on each side have vertical slats. The tall and narrow stature of Royal Mission 3265 Bookcase is a great way to effeciently add a ton of bookshelf space to your room while adding plenty of style. The Royal Mission styling stands apart with it's solid corbels, side slats, and walnut diamond inlays. This bookcase will last for years since it's hand made by Amish craftsmen using only the highest quality woods. For a unique bookcase, the Shaker Barrister bookcase is a natural option. With three large shelves with glass doors, this bookcase offers stylish storage. The glass panels for each of the three shelves can be customized from a variety of options from the Amish Furniture Factory. The simple Shaker styling mean this bookcase won’t go out of style or look dated. Built out of solid wood, you can get this bookcase stained in a variety of shades to match your home. The Shaker Hill Bookcase pictured above is built in qs oak with Michael Cherry stain. Pictured in pine with Buttermilk paint body ang Ferret Brown stained top and shelves. Don't let your beautiful library go underappreciated on a bookshelf that isn't as wonderful as this one. This bookcase is constructed out of solid wood and has glass pandls that shows off your books. Larger versions of this style bookcase are available through Amish Furniture Factory. The Mission bookcase is elegantly designed and artfully crafted for a perfect way to showcase and organize your collections. The top and bottom of the bookcase feature subtle Mission-style details including geometric etching and arches respectively. The doors of this bookcase have glass panels with timeless parallel lines that exemplify Mission styling. Each door has a fixture to open and close the doors to reveal the five solid wood shelves inside. 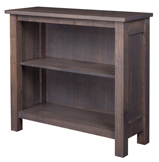 The pictured Spring Dale Printer Stand is built in red oak with FC-17882 Vintage Antique stain.